Many business leaders hesitate when you ask them to share their biggest mistake. Not Cynthia Maxwell. She keeps hers front of mind. In fact, she turned it into a management tool that she uses every day. Back when Maxwell was the Director of Engineering at Yahoo!, she was tasked with building a brand-new, multi-platform messaging product. It was the type of big, ambitious project engineers want to sink their teeth into — and she easily recruited one of her former coworkers from Apple. Then, one day, after a few months, he told Maxwell he was returning to Apple. There had to have been a red flag, so she stepped back to examine the broader context: Her team was building a flagship application, and carefully integrating stakeholders in design, engineering and leadership. She was deeply plugged into precise metrics like scrolling speeds, crash rates and memory usage. Eventually though, she realized the problem was less about the work itself, and more about how her people were feeling about doing the work. If she only had a clearer line of sight into how they were feeling, she could have responded better and earlier — and perhaps retained that talented programmer. Resolved to never again lose a great developer unnecessarily, Maxwell turned her engineer’s mind to the gaps in her management tooling. She was missing a way to turn emotion into data, and she found it in an unexpectedly fuzzy place: the age-old concept of flow. In this exclusive interview, Maxwell, who’s held engineering management roles at Slack, Apple, Yahoo! and Pinterest, explains how she built a concrete evaluative framework around flow. She shares the simple graph that has become one of the most powerful resources in her management toolkit. And she describes how anxiety and boredom creep into a team, and how managers can supportively nudge engineers back into the ideal state of flow. As she grew from one management role to the next — leading interns and architects alike — Maxwell had always cared about her engineers’ feelings toward their work. But she kept bumping up against the limits of conversation. “No matter how strong your toolkit is for effective one-on-ones, not everyone will open up right away,” she says. I've been at three companies that scaled 5x while I was there. At that speed, a "slow boat" to trust won’t cut it. You have to teleport to it. She needed a way to assess job satisfaction quickly and candidly. First, though, she had to find a framework for more clearly defining satisfaction. The tools in her work life — from NPS to qualitative satisfaction surveys — didn’t quite capture it for her. In looking for an answer, her mind would shift to her off hours as a yoga aficionado and DJ, during which she’d experienced firsthand the power of flow. Indeed, the term is often associated with artists and athletes, who are understood to do their best work when they’re “in the zone.” Gamers, too, might intuitively understand flow; it has been applied to game design for years, where deep user engagement is the benchmark of success. But how to channel this as a manager? At its most basic, the process is simple: during 1:1s, Maxwell asks her reports to mark the above graph to indicate where they are professionally. The version her team sees is stripped down to just its X- and Y-axis descriptors and the “flow beam.” Terms included above, like “apathy” and “boredom,” are just for her reference. Using them in conversations would drain some of the objective, quantitative value from the exercise. Maxwell’s job is to help guide her team into that effortlessly productive state, where skill and challenge meet: flow. THE TOOLS: Maxwell uses Google Sheets, for a couple of reasons. Thanks to its easy version control, she can quickly glance at each person’s history to see how their marks have moved. When meeting with remote employees over video, it also helps her simulate the experience of using this tool in-person together. She can see what they’re doing in real time. THE TIMING: For optimal results, Maxwell likes to randomize when she asks her team members for their input. When you ask, and at what intervals, is somewhat up to your intuition. You’ll want to at the end of a big project, for example, or following a particularly grueling sprint. She likes a cadence on the order of every two weeks. For new hires, she waits three weeks to first roll out the graph, to give them time to complete onboarding and start getting up to speed on a project. Her prompt is typically a simple, high-level question. “It’s usually something like, ‘How do you feel about the work that you're doing right now?’" She asks team members to consider the time period since they last completed the exercise. She’ll wait until they plot a point before they discuss. She’ll have the digital version of the last few completed exercises on her computer, so she can pull in context and discuss trends, as needed. But realistically, achieving and maintaining flow is a necessarily dynamic process. 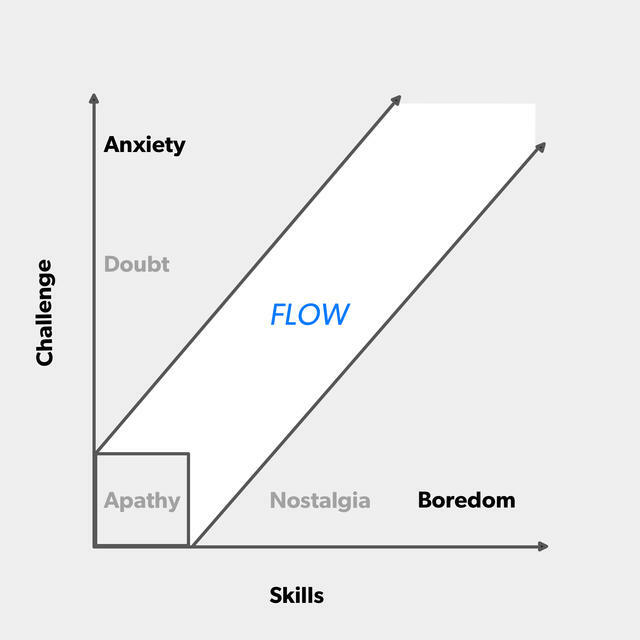 “You want to push your team just a little bit into anxiety and hope that they move back into flow over time.” There are the rare people who can stay right in the middle of the graph indefinitely. “And that’s cool, as long as long as you keep pushing them out of their comfort zone.” But the vast majority of paths will look more like a staircase — up from the “flow zone” and over back into it, over and over again. The secret is not to let people get too far out into the anxious or bored states. A little is a good sign of growth. Too much and you risk losing them. 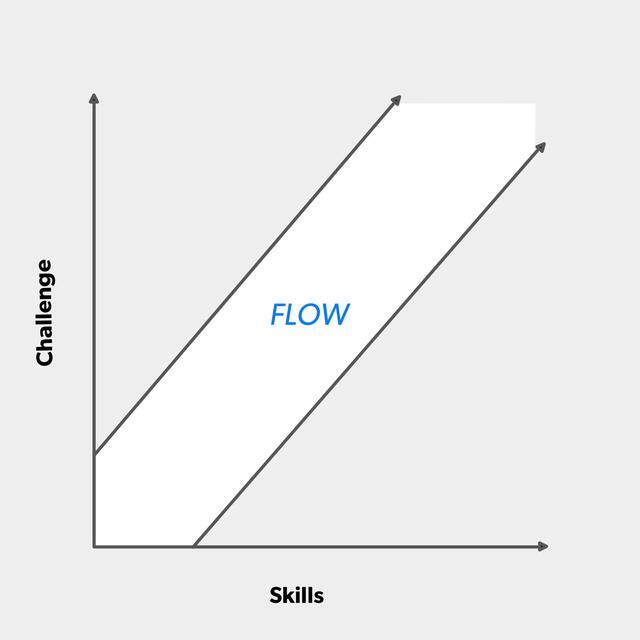 Maxwell appreciates that fellow veteran managers might be reluctant to employ a graph to initiate a conversation about flow. After all, it took experiences like the following for her to roll out the system to all of her engineers and interns in earnest. But once she did, it caught signals that she had missed — or worse, misinterpreted. Maxwell recalls an engineer she recently worked with, who, by all appearances, seemed deeply engaged in his work. As an engineer for a startup known for rapid releases, he rarely had any downtime. And he was great at his job, always ready with a status update. Surely, he had achieved flow. Without that engineer’s self-reporting during one-on-ones — using a clear, safe framework for sharing it — Maxwell might never have realized she wasn’t supporting him the right way. “I worked with him for a long time and I don't think I ever would've been able to get to it,” she said. “After that conversation, I helped create projects for him to build muscles outside of typical software engineering — ones that focused on release quality, and user experience metrics and reporting. These were the areas where he showed natural drive and interest. Here are a few more memorable cases from Maxwell — and the lessons each one taught her about nudging her team back into flow. The lesson for Maxwell was that conditions aren’t fixed. Managers can — and should — tweak things like magnitude of task, support, timeline, etc. if it can help move their reports back into flow. 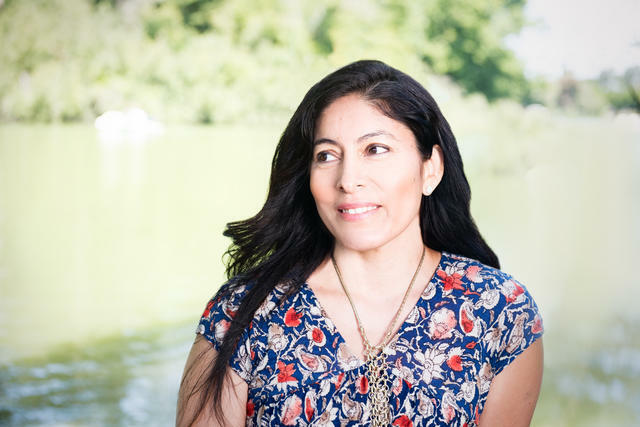 Other times, though, Maxwell has seen reports demonstrate an intuitive understanding of how to stay in flow — and her job has been to let them do just that. Your goal is to keep each report moving rightward along that “flow beam.” Most engineers will need an occasional push into anxiety to do that, but some may be able to follow a clean line. As long as you’re pushing each person in the way they need, you’re doing your job. This one is actually an aggregate, a common trajectory that Maxwell has seen seasoned engineers fall into again and again. Almost every newly hired developer starts in anxiety, following the information overload of onboarding, then settles into flow as they dig into a project. As projects get ready to ship, though, developers are at increasing risk of boredom. Try out this flow framework personally and pilot it with your team. Ask your reports to identify the point on the graph that most resonates with how they are feeling about their work. Consider taking the last ten minutes of 1:1s to have the conversation — and have each team member mark the graph digitally. That’ll allow you to track trends. Experiment to get the right cadence with your team, but start with every few weeks and around milestones, such as kickoffs or releases. Keep an eye out for movement outside of the “flow beam” into areas such as anxiety or boredom — or intermediate stations, doubt and nostalgia. Don’t panic if that happens. Most employees naturally move in and out of flow. Your job is to be as an accurate of a radar as possible — and to guide them back into their flow state.